R0-R1 Go upwards by the wall with sharp holds, 5- 7 meters to the bolt. 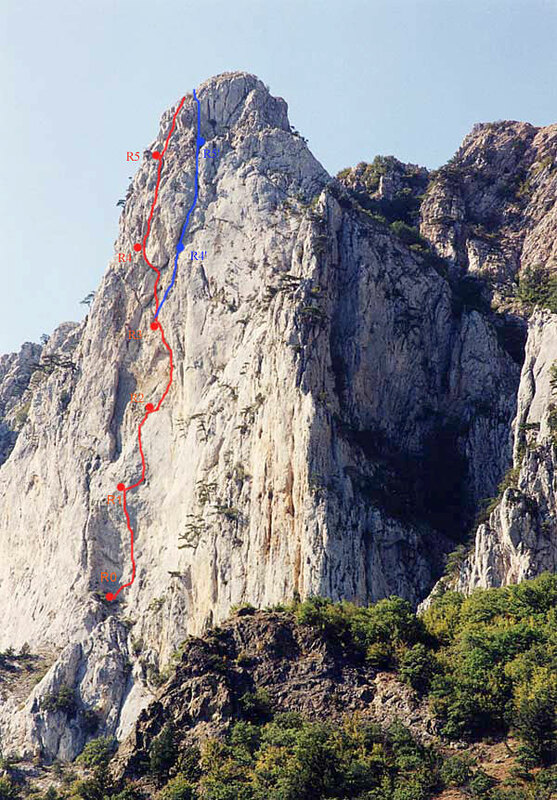 From the bolt traverse to the right to the crack, climb 10m upwards, then go by the vertical slab with bolts А 1, or climb 10m. From the last bolt turn to the left, into the corner, formed by the patch and the wall (sky hook), by the corner go upwards and to the left, (small and middle nuts) 10m to the direction of bolts. Then go upwards, by the bolt, climb upwards, pass the small overhang, climb to the belay. R1-R2 From the belay difficult traverse 5m to the right, then move 15m upwards by the interrupting crack, partially climb, partially AID (pins, nuts, and 2 bolts). Then go by the corner upwards and to the left, climb to the inclined ledge. Belay. R2-R3 From the belay go along the ledge to the right, and 10m upwards by the corner under the overhang. Then go upwards along the overhanging corner by AID, there are 4 bolts, in the upper part there are nuts. 10m, then climb by the crack to the belay. R4-R5 10m difficult climbing upwards from the belay, via the overhang to the corner (nuts, friends.) Then go upwards along the corner, in 15-meters climb to the easy, but destroyed rocks. R5-R6 Then go upwards by the destroyed corner, till the plateau. Go 15m to the right and upwards from the belay by the overhanging corner, then move upwards by the crack to the base of the big chimney. Belay. By the chimney go upwards difficult climbing belay on friends, climb to the ledge. Then go upwards by the corner, to the summit. Variation is rarely visited, though it isn't less interesting then the main route.